The Books Are My Bag Readers Awards are one of a kind. 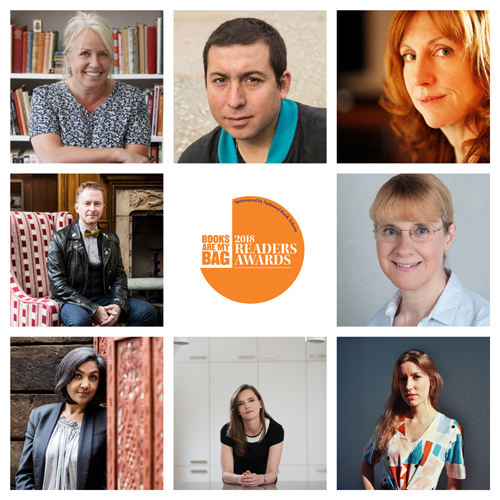 They're the only book awards curated by bookshops and voted for by booklovers. 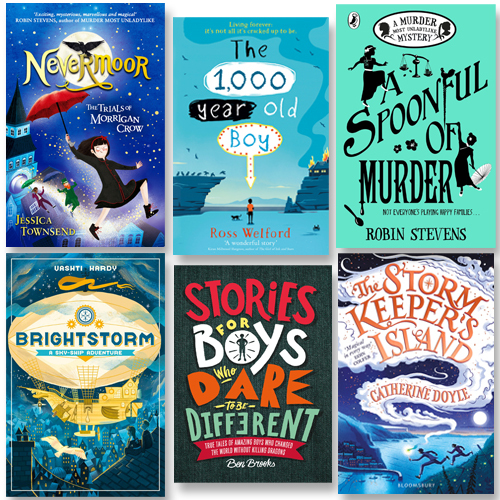 This year's awards, back for a third year, include a new Poetry category alongside seven other awards including Novel, Non-Fiction and two categories for books written for younger readers. 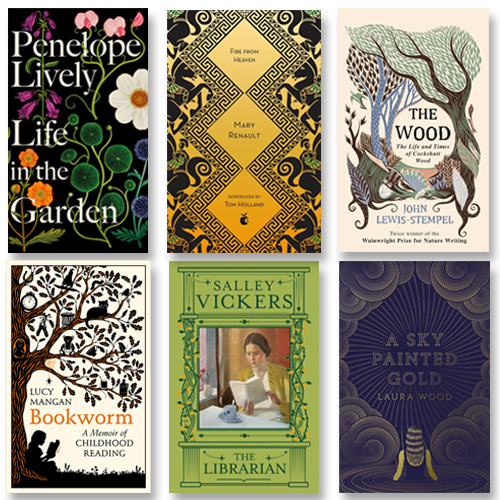 Seven of the shortlists were chosen by booksellers across the UK and Ireland, while the Readers' Choice Award – nominated and voted for entirely by booklovers – completes the set. 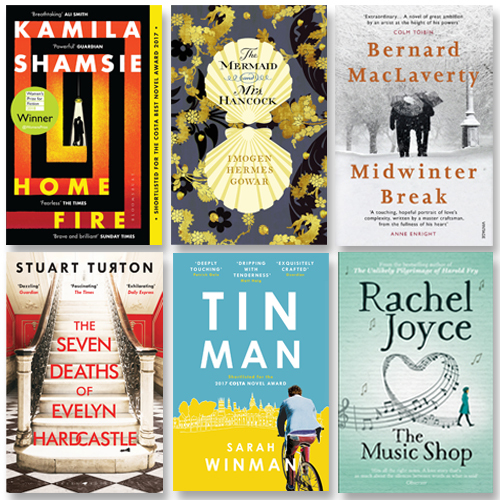 This is truly the year of the debut, with Stuart Turton's dazzling and genre-bending The Seven Deaths of Evelyn Hardcastle scooping up the Novel Award, while Gail Honeyman celebrates a much-deserved win in the Readers' Choice category for Eleanor Oliphant is Completely Fine. 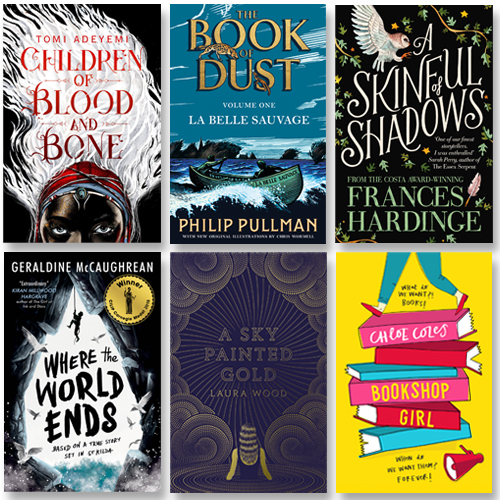 All of this year's winners are below - and you can win one of ten sets of the winning titles over on Caboodle. Find out more about previous winners of the Awards. Home Fire by Kamila Shamsie – A powerful modern take on the story of Antigone, Women’s Prize-winner Shamsie explores the clash of loyalties when love and politics collide. The Mermaid and Mrs Hancock by Imogen Hermes Gowar – A mermaid’s arrival in glittering, dangerous, Georgian London is the catalyst for this spell-binding tale of curiosity and obsession. Midwinter Break by Bernard MacLaverty – A retired couple fly to Amsterdam for a midwinter break, but amongst the wintry streets and icy canals, the fractures in their relationship start to appear. WINNER: The Seven Deaths of Evelyn Hardcastle by Stuart Turton – The beautiful Evelyn Hardcastle has been killed – but until Aiden can solve her murder, the day will repeat itself… over and over again. Tin Man by Sarah Winman – A tale of human kindness, loss and the transformative power of art, this is a love story that is both much more complicated – and much more simple – than it first appears. The Music Shop by Rachel Joyce – Frank always knows the perfect piece of music for a person, at the time they need it most. But then along comes Ilsa, who faints outside his record shop and changes everything. I Am, I Am, I Am: Seventeen Brushes with Death by Maggie O'Farrell – A memoir with a difference, O’Farrell tells the story of her life by recalling the moments that threatened to end it. The Diary of a Bookseller by Shaun Bythell – A wry and hilarious account of life in Scotland's biggest second-hand bookshop, and the band of eccentrics and book-obsessives who work there. Notes on a Nervous Planet by Matt Haig – Drawing on his own experiences in a frantic world, Matt Haig takes a personal and vital look at how to feel happy, human and whole in the twenty-first century. Educated by Tara Westover – Raised by a strict Mormon family, with a volatile father and violent brother, Tara Westover had to fight for the education that would free her. This is her powerful memoir. WINNER: The Secret Barrister: Stories of the Law and How It’s Broken by The Secret Barrister – Welcome to the world of the Secret Barrister. These are the stories of life inside the courtroom. They are sometimes funny, often moving and ultimately life-changing. 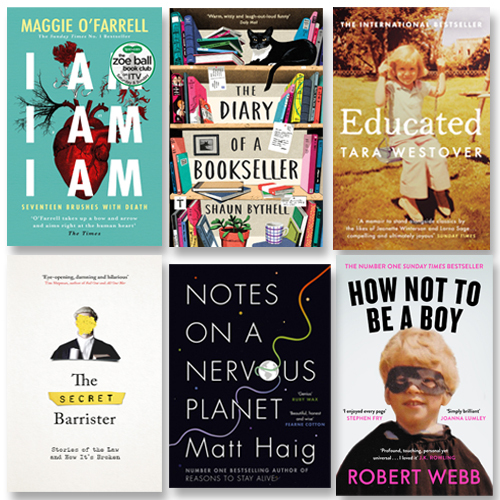 How Not To Be a Boy by Robert Webb – A hilarious and heartbreaking exploration of the relationships that made Robert who he is as a man, and the lessons we learn as sons and daughters. She Must Be Mad by Charly Cox – This debut collection is for every woman surviving and thriving in today’s world, for every girl who feels too much; this is a call for communion, and you are not alone. 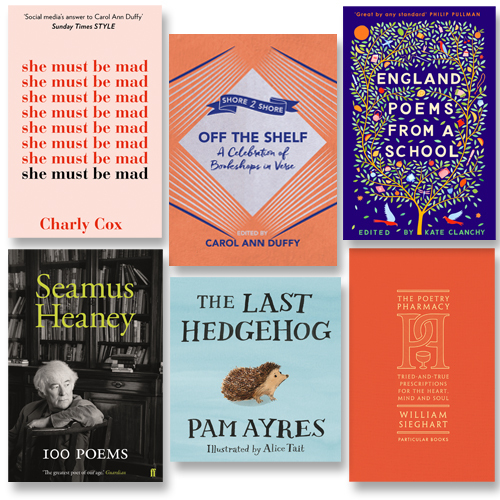 Off the Shelf: A Celebration of Bookshops in Verse edited by Carol Ann Duffy – What could be more perfect than a poem about a bookshop? Our Poet Laureate edits this specially commissioned collection. England: Poems from a School edited by Kate Clanchy – Oxford Spires Academy is a small school with 30 languages. This collection brings together poems as fresh, bright and present as the young migrants who produced them. 100 Poems by Seamus Heaney – An intimate gathering of poems collected by the late poet’s family, this brings together some of Heaney’s most loved and celebrated poems, and some new favourites. The Poetry Pharmacy: Tried-and-True Prescriptions for the Heart, Mind and Soul by William Sieghart – After touring the country with his Poetry Pharmacy, prescribing verses as balms for the soul, William Sieghart distils his dispensary into this essential collection. 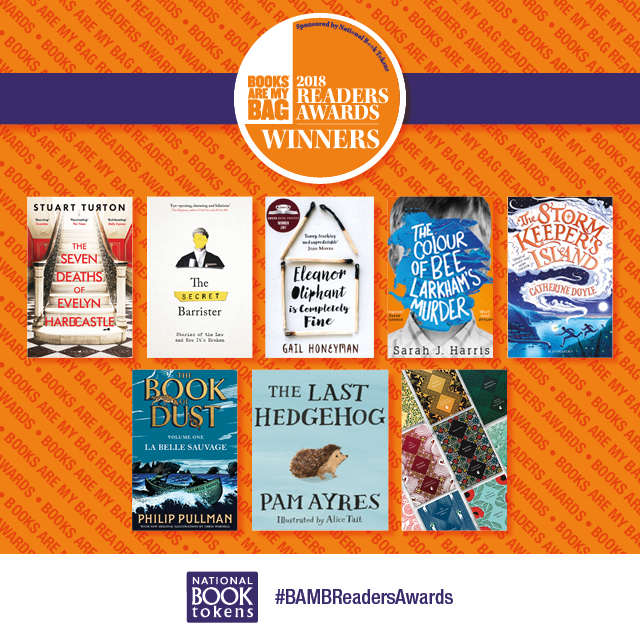 WINNER: The Last Hedgehog by Pam Ayres, illustrated by Alice Tait – A delightful, hilarious and thought-provoking elegy to that most beloved inhabitant of the British countryside, the common hedgehog. Nevermoor by Jessica Townsend – Morrigan Crow is cursed, destined to die on her eleventh birthday. But, as the clock strikes midnight, she's whisked away to the secret city of Nevermoor and invited to join the Wundrous Society. The 1,000-year-old Boy by Ross Welford – Alfie Monk is like any other nearly teenage boy… except he’s 1,000 years old. When everything he loves is destroyed, he sets out to find a different way to live – and to make sure he will eventually die. A Spoonful of Murder by Robin Stevens – When her grandmother passes away, Hazel travels to Hong Kong with her friend (and partner in solving crime) Daisy. But not only does an unexpected family member await, Hazel is also framed for murder! Brightstorm by Vashti Hardy –Twins Arthur and Maudie set sail from Lontown on the winged ship Aurora to clear their father’s name after his death on an expedition. Will they find the answers they seek? Stories for Boys Who Dare to be Different by Ben Brooks and Quinton Winter – This extraordinary compilation features the stories of 100 famous and not-so-famous men, every single one of them a rule-breaker and innovator in his own way – and all who dared to be different. WINNER: The Storm Keeper's Island by Catherine Doyle – Once in a generation, Arranmore Island chooses a new Storm Keeper. But as the battle to become the island's next champion rages, a more sinister magic is waking up, intent on rekindling an ancient war. Children of Blood and Bone by Tomi Adeyemi – Tomi Adeyemi conjures a stunning world of dark magic and danger in her West African-inspired fantasy debut, soon to be made into a film. WINNER: La Belle Sauvage: The Book of Dust Volume One by Philip Pullman – The first book in Pullman’s eagerly-awaited new trilogy, this tells the story of 11-year-old Malcolm and his efforts to protect the baby Lyra. A Skinful of Shadows by Frances Hardinge – Makepeace has been possessed by a ghost, which may be her only defence in a time of dark suspicion and fear. Which is worse: possession – or death? Where the World Ends by Geraldine McCaughrean – Summer, 1727. A group of men and boys are abandoned on a remote sea stack to harvest birds for food. Is it the end of the world? How can they survive? A Sky Painted Gold by Laura Wood –When the Cardew family arrives in sleepy Cornwall for the summer, they draw 16-year-old Lou into a world of glamour… but is there something dark at the family’s heart? Bookshop Girl by Chloe Coles – Paige Turner finds out that Bennett’s Books – her haven and beloved place of work – is under threat of closure. Can she save the day? And will she be able to get gorgeous artist Blaine out of her head? A J Pearce (Dear Mrs Bird) –AJ was born in Hampshire, UK. She began writing as a hobby in 2005. In 2012 she came across a 1939 copy of a weekly women’s magazine and the idea of a writing a novel set in wartime London was born. Since publication, translation rights for her debut novel, Dear Mrs Bird, have been sold in a further twelve countries and the novel has been optioned for development for television. AJ was chosen as one of The Observer’s New Faces Of Fiction Debut Novelists 2018. She is currently writing her second novel. Tommy Orange (There There) – Tommy Orange is a recent graduate from the MFA program at the Institute of American Indian Arts. He is a 2014 MacDowell Fellow, and a 2016 Writing by Writers Fellow. He is an enrolled member of the Cheyenne and Arapaho Tribes of Oklahoma. He was born and raised in Oakland, California, and currently lives in Angels Camp, California. There There is his debut novel. Polly Clark (Larchfield) – Polly Clark was born in Toronto, Canada in 1968 and was brought up in Cumbria, Lancashire and the Borders of Scotland. Selected in 2004 as one of Mslexia magazine’s ten-best poets to emerge in the last decade, her collections have, among other accolades, won the Eric Gregory Award and been shortlisted for the T.S. Eliot Prize. She produces the Literature Programme for Cove Park, Scotland’s International Artist Residency Centre, where she programmes a range of writers and events, and currently lives in Helensburgh – the setting for her debut novel about W.H. Auden, Larchfield. Joe Heap (The Rules of Seeing) – Joe Heap was born in 1986 and grew up in Bradford, the son of two teachers. In 2004, he won the Foyle Young Poets award, and he is a published poet. He studied for a BA in English Literature at Stirling University and a Masters in Creative Writing at Glasgow University. Joe lives in London with his long-suffering girlfriend, short-suffering baby, and much-aggrieved cat. The Rules of Seeing is his first novel. Laura Carlin (The Wicked Cometh) – Laura Carlin left school at sixteen to work in retail banking and it was only after leaving her job to write full-time that she discovered her passion for storytelling and exploring pockets of history through fiction. She lives in a book-filled house in beautiful rural Derbyshire with her family and a very naughty cat. When she's not writing she enjoys walking in the surrounding countryside. The Wicked Cometh, a deliciously dark and chilling novel set in 19th century London, is her first book. Preti Taneja (We That Are Young) – Preti Taneja was born in England. As a child, she spent most of her holidays in New Delhi. Her career has included human rights reporter, filmmaker in Iraq, Jordan, Rwanda, and Kosovo, and editor of Visual Verse, an online anthology of art and words. Preti's debut novel, We That Are Young, is published in the UK by Galley Beggar Press, and in India by Penguin Random House. WINNER: Sarah J. Harris (The Colour of Bee Larkham’s Murder) – Sarah J. Harris is an author and freelance education journalist who regularly writes for national newspapers. She became fascinated by synaesthesia and face blindness during her work as a journalist. Sarah previously wrote YA under a pseudonym and The Colour of Bee Larkham’s Murder is her debut adult novel. She lives in London with her husband and two young children. Sophie Mackintosh (The Water Cure) – Sophie Mackintosh was born in South Wales in 1988, and is currently based in London. Her fiction and poetry has been published in Granta Magazine, The White Review and The Stinging Fly, amongst others. Her short story ‘Grace’ was the winner of the 2016 White Review Short Story Prize, and her story ‘The Running Ones’ won the Virago/Stylist Short Story competition in 2016. The Water Cure is her debut novel. Every year, thousands of people discover brilliant new books on the shelves of their local bookshop. This unique award opens up the floor to you - the reader! This is your chance to tell us which book most captivated, entertained or inspired you over the last 12 months, whether it was a newly-published novel or non-fiction title, or a classic you finally picked up and enjoyed. 10 x winners will win a £100 (€120) National Book Token gift card. By entering into this vote and prize draw, you agree to be bound by these terms and conditions. To be entered into the prize draw, at least one vote must be received for an award category. Winners will be drawn from votes received through the main voting page at nationalbooktokens.com/vote as well as votes placed by young readers (aged 7-18) through the Young Readers Award voting page at nationalbooktokens.com/young-readers-vote. Duplicate entries will not be accepted. By entering, entrants acknowledge that the prize draw is a game of chance, which does not involve exercising any skill or judgement. The public vote and prize draw close at 23:59 on 5th November 2018. Voters are allowed one vote per award category; the outcome of the popular vote will directly determine the winner of each category. We will contact winners by email. In the event of a winner not responding after 7 days, we reserve the right to allocate the prize to another winner.